Establishment Republicans who voted for the hated “CRomnibus” spending bill that funds Obama’s unconstitutional attempt to grant amnesty to millions of illegal aliens seem to think that the 70% (or more) of voters who oppose amnesty would immediately suffer a mass amnesia event and forget that they betrayed their country and conservative principles by voting with Obama and the cheap labor wing of the U.S. Chamber of Commerce. But the recent experience of Rep. Lynn Jenkins (KS-2) who made the mistake of voting for the “CRomnibus” and then having a town hall meeting indicates that voters understand the betrayal perpetrated by the Republican establishment and are not going to forget it. Peter Hancock of the Lawrence (Kansas) Journal-World, reports that Jenkins, speaking at a town hall meeting at O'Malley Beverage in the North Lawrence Industrial Park, said the spending bill that recently passed Congress only funds the Department of Homeland Security through February as a protest over President Barack Obama's use of executive orders to change federal policy on immigration. Of course as we detailed in our article "How the CRomnibus and GOP Leaders Are Screwing American Workers" that is a lie. "So that is the issue that we have simply placed early into next year, and we will have an opportunity to have a discussion about that issue when the new Congress is seated," Jenkins said. Notice the contemptuous phrasing “have a discussion” as opposed to making a commitment to oppose and defund Obama’s attempt to grant amnesty to illegal aliens. But, Hancock reports, many of the roughly 80 people who attended said they didn't want to wait that long and said they were frustrated that Jenkins voted to provide any funding to the Department of Homeland Security, which runs the Department of Immigration and Customs Enforcement. "They don't need to be funded, they don't deserve to be funded. Illegal aliens are exactly that," said Renee Slinkard, who said she lives near Kansas City, Kan. "You're giving them Social Security. You're giving them applications to where they can get work permits that take away the jobs. You're giving them all of these subsidies that we have to put out with our hard-earned money." Another man who didn't provide his name accused the meatpacking industry of using illegal immigrants to break labor unions, cut wages and reduce health care benefits. Jenkins’ response was typical of establishment Republicans, “We have to fix the illegal and the legal immigration system and let the market bear the price," Jenkins said according to Peter Hancock’s reporting. Of course every honest person in America recognizes that it is not the immigration system that is broken – it is the border security system that has been intentionally broken by Barack Obama. But Representative Martha Roby’s (AL-2) attempt to throw up a smoke screen to cover her betrayal may be even worse than Lynn Jenkins’ and it also involves outright lying about what she voted for. This is as bold a lie as a politician has told in a long time. This directly provides $4 million to immediately process the paperwork necessary to implement amnesty for illegal aliens – and since it appropriates fees it also proves that House Appropriations Chairman Hal Rogers was just plain lying when he said that the House couldn’t do anything to stop amnesty since the money came from fee-based accounts. Not only that, but on page 909 the bill grants millions of dollars to the Obama administration to educate and process the amnesty applications of the thousands of “UACs” or unaccompanied minor children that have flooded into the U.S. since Obama’s amnesty plan became common knowledge on the streets of Central America. This shameful betrayal America’s workers and their families comes in the language on page 909 “regarding UACs: English Language Acquisition” where the bill appropriates three quarters of a billion dollars to educate immigrant children and youth and gives $14 million in special grants to states with at least one county that received 50 or more unaccompanied minors from the tsunami of amnesty seekers that washed up on our southern border earlier this year. How many inner city kids in Montgomery could receive tutoring or training in computers or other job readiness skills for that kind of money? How many older workers in Montgomery, Mobile, Florence-Muscle Shoals and Anniston-Oxford where the unemployment rate is still well above the national average and workers have been unemployed for years in the Obama economy could be retrained for that kind of money? How schools in Bullock County, Wilcox County and Perry County (where the average income is around $10,000) could be upgraded to the world-class institutions needed to prepare American kids to compete in the knowledge economy of today for that kind of money? And then ask yourself if Obama and his establishment Republican allies like Martha Roby and Lynn Jenkins are spending that kind of money educating illegal aliens, will those illegal aliens ever be sent back to their home countries, or will they stay here to use their federally funded education to compete with you and your kids for jobs? America's workers and voters aren’t nearly as dumb as "Gruber Republicans" Martha Roby and Lynn Jenkins think they are. 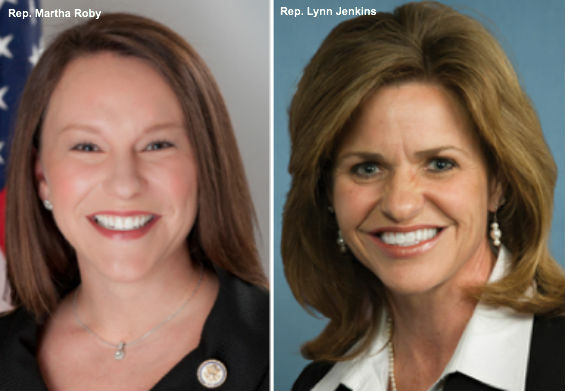 We urge you to go to our article “Will You Fire The First Shot In The Battle To Govern America According To Conservative Principles?” copy the letter to the editor and send it to newspapers, especially in Lynn Jenkins’ and Martha Roby’s districts. Show Jenkins, Roby and other Republicans who voted for the "CRomnibus" that you are on to their lies and you won’t be “Grubered” by the Republican establishment. Submitted by Pasadena Phil on Thu, 12/18/2014 - 11:36. Are those GOP congressmen and senators who now offer weak excuses for voting for Cronybus bill willing to now guarantee to us that they will absolutely not vote for Tammy Fay Boehner for Speaker and Harry Reid McConnell for Senate Leader? GUARANTEED?!?!?! Which of their lies are we supposed to believe now? Let's all stop talking about the 2016 GOP candidates and start focusing entirely on Mark Levin's Article V Convention and how we prepare for a solid 3rd party run with Cruz & friends leading conservatives out of the GOP/Whigs and into a new party that actually represents voters. We need to return to constitutional DELIBERATIVE government. Clearly, the new American fascism is failing. Submitted by ZIP5DO on Thu, 12/18/2014 - 21:16. These two "Gruber" like republicans must think we are all stupid. They lied and betrayed all who voted in November. They are the stupid ones if they think we will not remember their betrayal.